As an actor, how would you use Stanislavski's ideas on &quot;given circumstances&quot; and &quot;the magic if&quot; when prepairing a role for performance. AS AN ACTOR, HOW WOULD YOU USE STANISLAVSKI'S IDEAS ON "GIVEN CIRCUMSTANCES" AND "THE MAGIC IF" WHEN PREPARING A ROLE FOR PERFORMANCE? 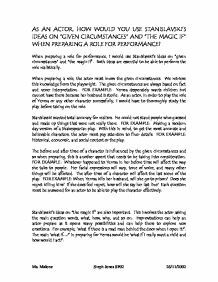 When preparing a role for performance, I would use Stanislavski's ideas on "given circumstances" and "the magic if". Both ideas are essential to be able to perform the role realistically. When preparing a role, the actor must know the given circumstances. We retrieve this knowledge from the playwright. The given circumstances are always based on fact and never interpretation. ...read more. FOR EXAMPLE: Making a modern day version of a Shakespearian play. With this in mind, to get the most accurate and believable characters, the actor must pay attention to finer details. FOR EXAMPLE: Historical, economic, and social context or the play. The before and after time of a character is influenced by the given circumstances and so when preparing, this is another aspect that needs to be taking into consideration. FOR EXAMPLE: Whatever happened to Yerma in her before time will affect the way she talks to people. ...read more. Each question must be answered for an actor to be able to play the character effectively. Stanislavski's ideas on "the magic if" are also important. This involves the actor asking the main question words, what, how, why, and so on. Improvisations can help an actor prepare as it opens many possibilities and can help them to explore new emotions. For example, 'what if there is a mad man behind the door when I open it?'. The main 'what if...?' in preparing for Yerma would be 'what if I really want a child and how would I act?'. Ms. Malone Steph Jones SF02 26/11/2002 ...read more. from, why, what you want, where you are going, and what you will do when you get there, you will be acting without your imagination". Some good techniques to develop the imagination are to prepare the body by relaxation and then being taken on a meditation by some else. am I; but if I were and old oak tree, set in certain surrounding conditions, what would I do?' In the preparation of a role this is crucial. In order to establish the realistic style of acting Stanislavski wanted to achieve, an actor must draw upon the realistic reactions of himself, and incorporate them into the role. Repression is a main theme in Yerma and so I would want to show this through my character. I am repressed by Juan but also by my religion as it is that which makes me stay with my repressing husband. The technique of flashback helps the audience to understand Sean better, when they go back in time to school days. Another character emerges as brother Gerrard, the lighting changes to that of a darkened space with a shadow of a church window. Every time I speak as Ui, I would have the cane in my hand but when I'm not speaking I would place the cane down so that the audience associates the cane with the character. This would mean that every time I hold it they can instantly see that I am Ui and not myself . This made the audience think deeper about the reason for having it. The phone box was amidst an unclean, filthy streetscape that looked like the aftermath of a war in some respects, and yet was still intact. Could this mean that it was the agent of such destruction - as it was to the Birling family? Yet her mask shows revenge, her arrogance allowing her to over-shadow any blame on her part. This was highlighted by the proxemics of the Stepdaughter to myself, her being centre stage ? unmissable ? and with the lighting on her it is like she is calling out to him.